Admittedly the least interesting match up of the evening. After Uruguay had drawn with Chile, people could be forgiven for ignoring the clash between Peru and a heavily depleted Mexican side, and in doing so they didn’t miss a whole lot. 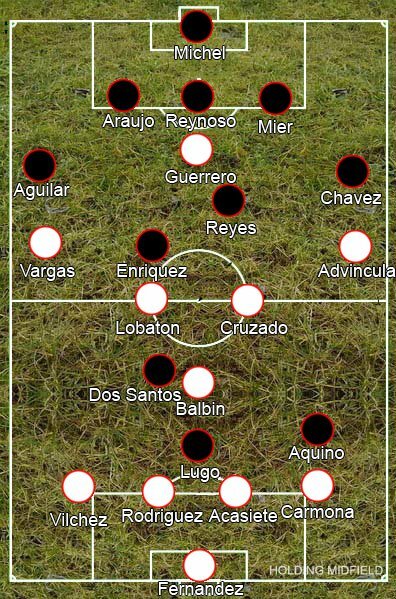 Peru set up in a 4-3-3, with star man Juan Vargas replacing Victor Yotun on the left, Carlos Lobaton and Giancarlo Carmona the other new faces, and looked to play a neat passing game to get the ball to the Fiorentina man whenever possible, his crossing obviously seen as the key to getting goals from aerial threat Jose Paolo Guerrero. Although Mexico kept broadly the same formation -Javier Aquino’s left wing positioning the only obvious change – their tactics differed quite a lot from the game against Chile. Against Claudio Borghi’s team, they had used an intriguing catenaccio-esque man-marking system, but against Peru they returned to a rather more basic, and dull, system, defending very deep and relying on the movement of the front three and Paul Aguilar, who had more license to attack down the right, to have any attacking influence. Mexico’s deep line caused them some problems – early on, a poor backpass let Paulo Cruzado in behind and the there were frequent shots from the edge of the area that could have gone in with a bit of luck. It did however help them in their main goal: to stop Peru from scoring, letting them play in front of them for most of the match. Often one of the Peru’s midfielders would drop into a holding role while another would moveÂ to make a 4-2-3-1, the extra holding midfielder just allowed Peru an easier outlet when passing out of defence, although Guerrero was a good enough holding the ball up to provide this for long balls when needed. As with the majority of the games so far, the game followed a basic pattern with few intricacies: Peru looked to attack with a patient passing game, while Mexico defended, rarely threatening. It wasn’t that boring, but it wasn’t hugely entertaining either, and it certainly wwasn’t tactically interesting, so Guerrero’s 82nd minute goal came as a a bit of a relief. There was nothing all that special about it, Mexico were just caught out following a corner. It’s a shame Mexico opted to ditch their system from the Chile game as it had added some tactical interest to an otherwise rather boring and certainly ultra-defensive side. If it was just a one-off to try and stop Chile, it’s probably a good thing they sit bottom of Group C, bearing in mind the lack of entertainment on offer from the Copa America so far. Peru, although unspectacular, do however look like a decent and fairly interesting side, so it will be interesting to see how far they can go in the tournament.